NYC based illustrator, children’s book author, and character designer Steven Salerno creates striking illustrations for editorial and advertising clients stylistically ranging from graphically simple and whimsical, to more realistic, richly textured images. Over his long independent graphics career he has created thousands of published illustrations for a list of nearly 600 clients for use in print & web advertising, magazines, newspapers, product packaging, publishing, corporate publications, and retail graphics. Steven is also the illustrator of 30 popular picture book titles for children (and the author/illustrator of 5 of these titles) -skillfully bringing to life expressive people and animals, and for period non-fiction titles his illustrative scenes successfully capture the look and feel of the story’s era. 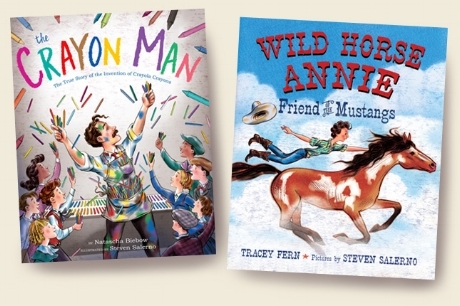 Some of Steven's picture book titles have been translated into Chinese, German, Korean, Japanese, Arabic, and Spanish. His illustrations have been recognized for excellence by Communication Arts, Print, Society for News Design, Society of Publication Designers, The Art Director's Club, Society of Illustrators (NYC), and the Junior Library Guild. His picture books have received industry starred reviews from Publishers Weekly, Kirkus Reviews, School Library Journal, Children's Literature, The New York Times Review of Books, and have been displayed by the Society of Illustrators (NYC) in their annual exhibition and children's picture book art exhibition. See list of Steven’s current and past illustration clients. Originally from Vermont, he is an honors graduate of the Illustration Department at Parsons School of Design in New York City, where he studied art history, printmaking, animation, and illustration under top industry professionals including famed author/illustrator Maurice Sendak, creator of the ground breaking picture book "Where the Wild Things Are," and many others. Today Steven is primarily engaged with illustrating/writing picture books for kids, though also still creates illustrations for client projects in print & web advertising, magazines, newspapers, corporate publications, product packaging, and retail graphics. Contact him directly to discuss your project requiring illustration images. The Crayon Man -The True Story of the Invention of Crayola Crayons (non-fiction) published by Houghton Mifflin Harcourt -written by Natascha Biebow & illustrated by Steven Salerno, the true story of American Edwin Binney, inventor of Crayola Crayons in 1903.
and Wild Horse Annie -Friend of the Mustangs (non-fiction) published by Farrar Straus Giroux -written by Tracey Fern & illustrated by Steven Salerno, the true story of Velma Bronn Johnston, horse lover and animal activist who in the 1970’s was the driving force behind the Federal Laws protecting wild horses on public lands. Steven also has a deep interest in the great game of golf... and creates striking golf art and graphics: from golfscapes to depictions of legendary golf professionals both past and present. Steven’s golf art & illustrations have been published by Golf Digest, GOLF magazine, LINKS magazine, GolfWorld magazine, and his portraits of top PGA Tour players appeared in the PGATour.com Spotlight feature section. In 2012 he created a series of golfscape paintings of signature golf holes designed by Golf Hall of Fame member and 4-time Major Championship winner, golfer and architect Ernie Els -for use in a series of print ads promoting Els Design golf course architecture company. Some of his golf art images can be seen in the golf portfolio section on this site. Contact Steven about your design project requiring golf art and graphics.